We got to our room and did a bit of unpacking before going across to a pub for some dinner with L&E. I had a cobb salad and broke my tooth! I managed the whole trip without visiting a dentist, so it wasn't too bad. The next morning, we went for breakfast in a diner called Times Square L&E visit quite often and had a cooked breakfast with sausage, bacon, eggs, hash browns - the works, plus lots of coffee. We had a wander around St. Lawrence Market looking at some of the food stalls and then we wandered up Yonge Street. Yonge Street is the longest street in Canada stretching for 86 kilometres. We ended up in the Eaton Centre, Toronto’s largest shopping centre. To be honest we spent most of that day in there wandering around, going into Williams Sonoma, Hallmark, Roots, Indigo and loads of others. That night we were exhausted and after Emmy had made us a lovely dinner of shrimp pesto pasta, we did go out for a wee while but came back early. I think the flight was still catching up with us. The next morning we headed out to an area to the east of the city called the Beaches. We jumped on a streetcar and ended up on a picturesque street lined with pumpkins and quaint wee shops. Heading south we did indeed end up at a beach on the edge of Lake Ontario, with a boardwalk running along it. We walked for what seemed like miles and the sky grew darker and greyer. The heavens opened and we jumped back on a streetcar and headed into the centre of the city. We grabbed lunch in Marche, in Brookfield Place, a smaller shopping centre with a lovely glass ceiling. We made our way back to L&E’s and got dressed for dinner. We were heading north of the city to visit Disneyboi’s other cousin Linda and her husband Claude who live in a gorgeous penthouse with fantastic views of Toronto. We were treated to a delicious dish of beef bourguignon and chocolate cake for dessert. And lots of wine. A bit worse for wear, we got an Uber back to L&E’s and got ready for the following day, picking up our marriage licence from city hall! That morning we headed over to Nathan Phillips Square with a quick stop for breakfast (coffee and a bagel) in Tim Hortons – THE Canadian coffee chain. We got to City Hall and getting the licence was a pretty straightforward process. We then headed over to Toronto Islands on the ferry with Lawrence, where we had a good walk from one end to the other, the views of the city are stunning from there. Our destination was the Rectory Café where our wedding would be held. We found the perfect spot for the ceremony to take place right outside the café, then headed inside for a pint of beer to make plans. We got the ferry back and headed into Loblaws, a huge supermarket at the bottom of the city, near the Redpath Sugar company. Disneyboi and I shopped around picking up loads of bits and bobs you just can’t get at home (and took more photos of pumpkins). That night we had dinner in the Distillery district, at the Mill Street Brewery restaurant with a gorgeous cheese and beer soup followed by burgers. Very tasty. The next day we wandered around the Church street area (where they have cool rainbow crosswalks) up to Yorkville and had a more leisurely day. This is where things took a bit of an exciting turn (for me). In the Hudson’s Bay department store, someone was doing a book signing. You had to buy some of her merchandise to then receive a copy of her new book (Vegetables) and a chance to have her sign your book. I bought a couple of pillow shams, got the book and queued. I got to the end of the line and found myself standing in front of -Martha Stewart! I’m not one for being starstruck, but with her I was! I just said 'my name is Stuart' she said ‘Oh is it the same spelling? ', I said 'no the other way' and that was it! Over in a flash. But she told me to enjoy the book though. 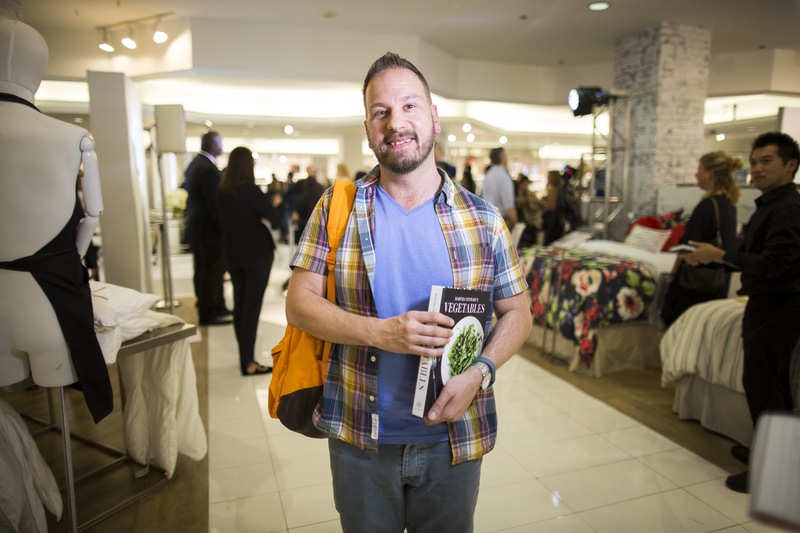 Upon leaving the queue, the Toronto Life online magazine stopped me and had a quick chat, meaning I ended up in an article about Martha Stewart fans! You can’t take me anywhere!! That night we went to the cinema attached to L&E’s condo building and watched Bridget Jones’s Baby (very funny) and had some sushi afterwards. The next day we did THE touristy thing, by going up the CN tower. We’d done this before, on our last trip there, but I was keen to go up again and stand (and sit) on the glass floor! It’s a funny sensation going up in the elevator at 20 feet per second. Your ears pop it’s so high. We also visited a steam railway museum outside the tower for a while before heading back to meet Lawrence who was taking us to meet a friend of his whom he had worked with many years previously at CBC (the Canadian equivalent of the BBC). We walked over to Janice’s lovely home and it was another gorgeous day, so we sat in her backyard and enjoyed the lunch she had prepared for us. Quiche, salad, cold meats, you name it. This was followed by beautiful butter tarts topped with pecans, blueberries and blackberries. We were stuffed!! The wedding was the following day. Canada Part 2 is coming soon! Congratulations! Looks like a great trip and lovely to hear you've tied the knot! And meeting Martha... wow. Though I so wanted the celebrity you met in a Canadian shopping mall to be Robin Sparkles. Looks such a great trip, and post, makes me want to go back! Looks like you had an amazing time!! When I got my book signed by Mary Berry I felt the same way.... although I'd love to meet Martha as well!! Can't wait for part 2!! Wow, amazing photos of a memorable trip! And it's so cool that you met Martha and got in an article about her fans! I know - you can't take me anywhere! !